So, what if you took all of that awesomeness and made a French toast version of it? When my sister, Cathy, showed me Betty Crocker's version, it CLEARLY fell into the "How can this not be good?" category. Of course, I tweaked the recipe ever so slightly, and then I decided to make it for Chris and Claire. It was an immediate hit and it was SUPER easy! It's also a time saver because you throw it together the night before you wanna serve it, then just pop it in the oven in the morning. Simple!! I think I might need to make this for Easter Brunch. I think you should too!!! Spray bottom of 13x9-inch (3-quart) baking dish with cooking spray. Arrange bread cubes in baking dish in an even layer. In large bowl, beat eggs, milk and 3/4 cup of the maple syrup with wire whisk. Pour over bread in baking dish. Using the back of a big spoon, press bread cubes down so that they get coated with the custard liquid. Cover and refrigerate 8 hours or overnight. Heat oven to 350°F. Uncover; bake 35 to 40 minutes or until golden brown along edges. Let stand 7 to 10 minutes before serving. Meanwhile, in medium microwavable bowl, microwave remaining 2 cups maple syrup uncovered on High 1 to 2 minutes, stirring every 30 seconds, until warm. Stir in rum extract. 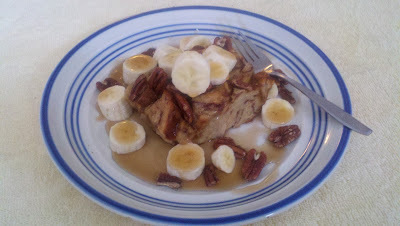 Sprinkle banana slices and pecans (if using) evenly over bread; drizzle with warmed syrup mixture. Serve immediately. This goes PERFECTLY with your favorite crisped bacon or sausage. Just sayin! 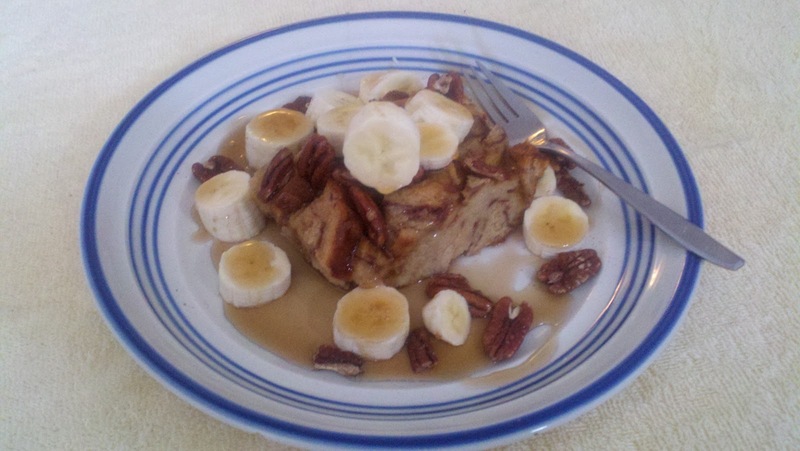 The French toast part of this recipe serves as a blank canvas for any kind of topping you like. If bananas are not your thing, try any kind of fresh fruit! Sliced ripe peaches or apples sprinkled with a little cinnamon sugar would be amazing. Also strawberries or blueberries. Oh, and make sure you heat the maple syrup. It's just SO much better that way!! !